The July employment report offered a welcome respite from disconcerting global economic news and the protracted debt-ceiling debate in Washington. 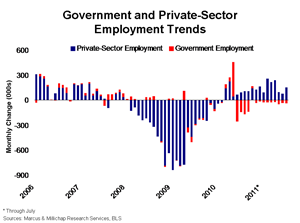 Despite private-sector payroll gains for 17 consecutive months, the pace of job creation remains tepid, reiterating continued caution among employers. The growth in payrolls last month, and upward revisions to May and June jobs, nonetheless offer a positive counterpoint to the possibility of a double-dip recession, however hiring plans for coming months may have softened due to uncertainty. The ongoing difficulties in Europe, for example, present a significant risk to the U.S. economy, as any drop in demand for American-made goods will reverberate through the manufacturing and trade sectors. 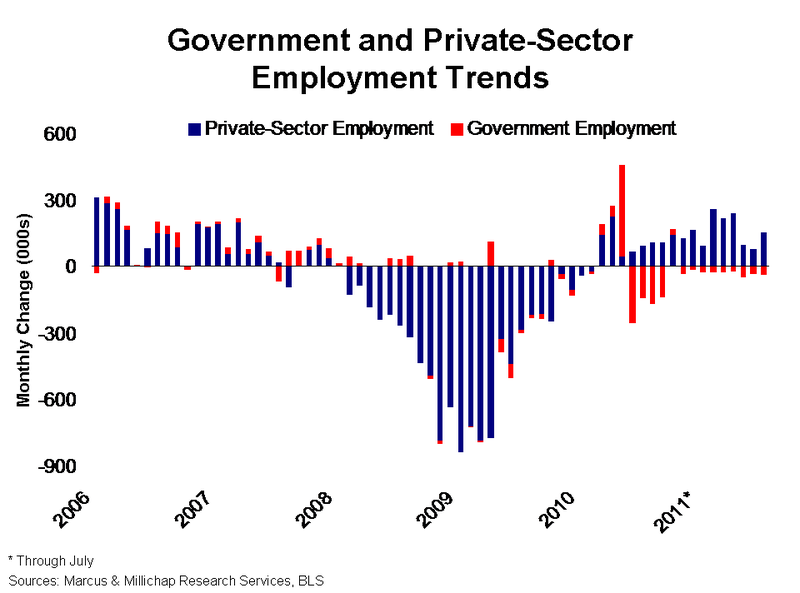 Private-sector job growth was broad-based last month, adding a net 154,000 jobs. Factoring in government employment, a total of 117,000 jobs were created in July. Although a key index of manufacturing activity fell last month, manufacturers added 24,000 positions, the ninth consecutive monthly increase. In addition, the restoration of health care coverage for many re-employed workers helped generate 38,000 jobs in education and health services. Financial activities and information were the only drags among the private-employment sectors, trimming a combined 5,000 jobs last month. Reduced tax revenues continue to strain budgets and force job cuts in the government sector. Led by losses in state and local positions, government agencies slashed a total of 37,000 jobs in July. The included furlough of 30,000 positions in Minnesota, which have since been restored, will mitigate next month’s figures. Year to date, 218,000 government jobs have been cut, and additional losses may emerge as new deficit legislation takes hold. So far this year, 243,000 full-time office-using workers have been hired, with additions in professional and business services offsetting losses in financial activities and information. Hiring has enabled office tenants to backfill under-utilized space, but has not yet resulted in significant expansions of space needs. In the first half of 2011, national office vacancy ticked down 10 basis points to 17.5 percent as positive net absorption totaled 8.5 million square feet, representing a meager 0.3 percent increase in occupied stock. This year, national office vacancy will decline 60 basis points to 17 percent, primarily as a result of minimal construction. Private-sector job creation continues to stoke demand for rental housing, leading to a 30-basis-point decline in national apartment vacancy in the second quarter to 5.9 percent. Tenant demand will likely swell further, driven by additional job growth, the de-bundling of households that doubled up during the recession, and continuing weakness in the for-sale housing market. As a result, national apartment vacancy will fall 100 basis points this year to 5.6 percent, while asking and effective rents will advance 3.5 percent and 4.5 percent, respectively. This entry was written by marcusmillichap, posted on August 6, 2011 at 12:56 am, filed under Research and tagged Employment. Bookmark the permalink. Follow any comments here with the RSS feed for this post. Trackbacks are closed, but you can post a comment.